Dimensions 2.25 by 8 by 9.75 in. From Lovecraft to Borges to Gaiman, a century of intrepid literary experimentation has created a corpus of dark and strange stories that transcend all known genre boundaries. Together these stories form The Weird, and its practitioners include some of the greatest names in twentieth and twenty-first century literature. Exotic and esoteric, The Weird plunges you into dark domains and brings you face to face with surreal monstrosities. You wonÃ¢ÂÂt find any elves or wizards here...but you will find the biggest, boldest, and downright most peculiar stories from the last hundred years bound together in the biggest Weird collection ever assembled. 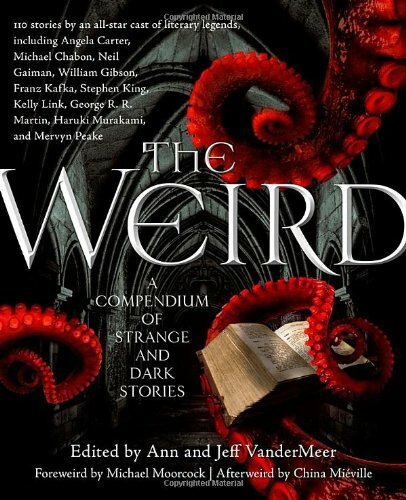 The Weird features 110 stories by an all-star cast, from literary legends to international bestsellers to Booker Prize winners: including William Gibson, George R. R. Martin, Stephen King, Angela Carter, Kelly Link, Franz Kafka, China MiÃÂ©ville, Clive Barker, Haruki Murakami, M. R. James, Neil Gaiman, Mervyn Peake, and Michael Chabon. About: From Lovecraft to Borges to Gaiman, a century of intrepid literary experimentation has created a corpus of dark and strange stories that transcend all known genre boundaries.